Baby’s First Year End Award! 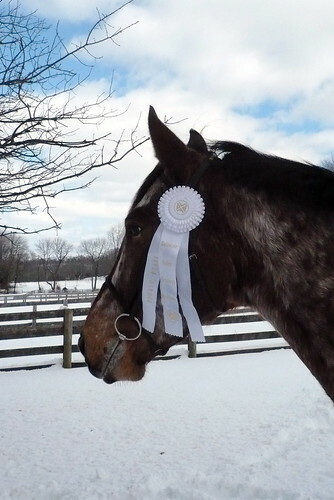 And speaking of ribbons…you can clearly see that things are not going well financial for the local show grounds. When Gen and I got a year end from them back in 2006 (I cannot believe it was 4 years ago already!) it was a huge ribbon about 3 feet long. This year it is normal ribbon size, but with an extra ruffle up top. I also noticed how tiny there ribbons were at the hunter shows (the dressage shows had big beautiful left over ribbons from when they did USDF shows). If it is possible to judge a show grounds financial health by ribbons things are not looking good for the local show grounds! I hope I am wrong and they just cheeped out because not only have they been around for over 60 years and the legacy they have is amazing with many Olympians getting their start at those show grounds so they don’t need to have fancy pants ribbons. I plan on showing there this year and have already paid my membership dues. Clearly size of ribbon does not matter to me and not only was I thrilled to get that ribbon this year but I will be perfectly happy if I get lucky enough to get a ribbon the same size as this one next year!